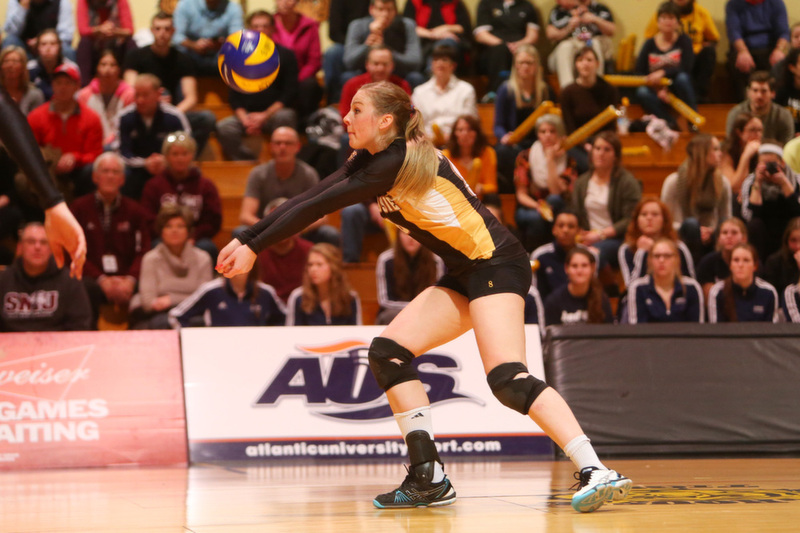 Before Dalhousie won the Atlantic University Sport (AUS) women’s volleyball championship earlier this month, graduating player Katherine Ryan knew what to expect. There would be jubilation if the Tigers won their second straight title, as the bench cleared and players stormed the court. There would be hoots and hollers from the Dalplex faithful. There would be family members to hug and friends to embrace. All of this Ryan anticipated. What she admittedly joked about—but never expected—was receiving a replica trophy from her friends. She got the Wooden X, a keepsake provided to every St. FX athlete who wins an AUS title. When Ryan was at St. FX, she never won it. Then, this summer, as a member of the Tigers, Ryan watched from afar as St. FX unceremoniously axed its women’s volleyball program. There would be no Wooden X’s to give to the left-side hitter’s former teammates in Antigonish, but a kind gesture from the boyfriend of Ryan’s best friend meant there would be one more. He made the memento by hand, with two wooden beams protruding from the base to form a giant ‘X’ and a volleyball player figurine planted next to it. The trophy is not a lavish creation by any means, but the gesture touched the Halifax native. The trophy also demonstrates the confidence Ryan’s friends had in the Tigers’ ability to repeat as AUS champions. After an early season 4-4 record, the Tigers ended the regular season on a tear, winning eight straight. By the time the six-team women’s volleyball championship was held from Feb. 14-16, the Tigers were clearly the jewel of the conference. Dal looked the part in their straight-set championship victory over the Saint Mary’s Huskies on that Sunday afternoon. They leapt to a phenomenal 10-1 lead in the opening set. Saint Mary’s closed the set respectfully, but were outmatched by a Tigers team led by four kills from Tara Gowan and three more courtesy of Desiree Nouwen. The second set was closer, and the third set was as well, peaking at 18-18. Following a few errors by Saint Mary’s, with the Tigers up 22-20, Dal’s men’s volleyball team arrived at the Dalplex almost on cue. The men, who had just come off the bus from Fredericton where they had won their own AUS banner the night before, cheered on their counterparts who finished the job on a 3-0 run off a block from Nouwen. Set scores were 25-10, 25-17, 25-20. 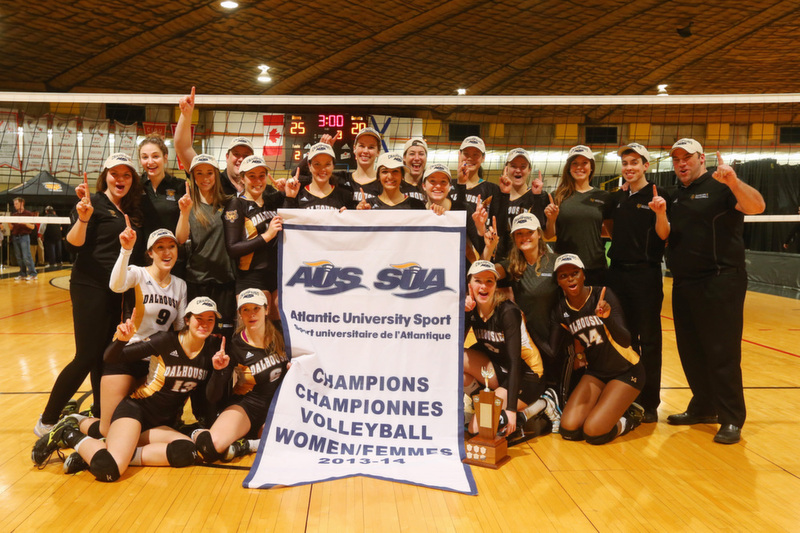 Dal became the first AUS squad to win back-to-back women’s volleyball titles since SMU achieved the feat in 2006-07. Earlier in the weekend, the Tigers overwhelmed Moncton (25-16, 25-13, 25-19) in the semifinal to earn a berth in the title game. As a reward, the Tigers will represent the conference in the Canadian Interuniversity Sport women’s volleyball championship this weekend at the University of Regina. Ryan, in her last season as a student-athlete, awaits the challenge.